There is a sound I miss in the Big Cypress Swamp. Its a sound that always started in the distance and per chance came closer, but then sometimes moved further away. Usually faint at first, a soft mournful sound was heard through the cypress slough and prairie. This sound, baying swamp music in the wind, usually changed to a shorter more excited choppy sound after a period of time. Moving left or right, but rarely moving straight ahead, the pace of the sound matching the pace of the chase, as hound tracked deer in the swamp. A tradition that ended many years ago, the hunting of deer with dogs in the Big Cypress Swamp, was not a tradition that I was part of, but still I appreciate the sounds of a trained dog working a swamp deer. A dog with a exceptional sense of smell, trained to pick the scent of a deer from the scent of other swamp animals, first working a faint trial on the ground. A trail invisible to humans, except for the occasional deer print in the mud, but clearly visible to the dog. Having a sense of smell so acute that it can tell which direction the deer has gone, by the near undetectable difference in strength of the scent. A working dog upon encounter the scent trail would work back and forth on the scent until it was sure the direction the deer had gone. Then with nose to the ground, off it would go, running at speed, following the scent left by the passing of the deer. Letting loose with a baying, as it ran along, it incremented the sound with the strength of the scent. As the scent becomes stronger, so does the baying, with the time between bays getting shorter and shorter. One might ask, how does a hunter use a dog tracking a deer, to harvest the animal. It would seem, that the dog would chase the deer from the hunter, rather then allowing the hunter a chance to see the deer. The secret of course is the nature of deer themselves. Deer when chased by a predator, does not run straight away for miles, but it turns and circles back. The deer in their evolution, have learned to circle back, sometimes crossing their own scent trail, over and over again to confuse predators. Doe deer will circle rather quickly, Bucks go further, maybe a mile before circling back. A smaller dog, such as a beagle, will not pressure (get close to) the deer and the deer will circle sooner. A larger dog, such as a big hound, will pressure the deer more and the deer with run further away before circling back. Its the circling back, that allows the hunter the chance to see the deer. The hunter must read the sounds of the dog's direction and move in front of the chase, to be able to see the deer. Not an easy task in the Big Cypress Swamp. The truth of the matter is that deer hunters using dogs in the swamp, were no more successful in the harvesting of deer, then hunters using other methods. A hunting dogs training starts early in its life. It actually starts with its genetics usually coming from past generations of dogs that have been used for hunting and tracking. A good nose and stamina are breed into them over generations. These dogs come in all sizes and shapes, but they all have the same traits needed for tracking and hunting game. Even with the natural ability to scent and track game, their training for hunting usually starts by running the young dogs with older experienced dogs. This teaches them to be discriminating in which scents to follow. Tracking a deer, rather then a rabbit or raccoon is taught by mimicking the older dogs. The most experienced dogs can even tell the difference between the buck and doe deer. So the older dogs, with the young dogs following as fast as they can, trail the deer, nose to ground, crossing water and other animals trails, knowing which is deer and which is not. Something not taught by the older dogs is avoiding snakes. The Big Cypress Swamp is home to the poisonous Eastern Diamondback Rattler, Pigmy Rattler, Coral snake and Water Moccasin. The strike of the Diamondback and Water Moccasin will kill a dog. The strike of the Pigmy Rattler will make the dog very sick. Its not likely that a dog will be bit by a Coral Snake, because they don't have fangs and strike, like the other snakes. The method I have seen used to teach the young dogs to avoid snakes, would horrify most nature and dog lovers, but it is very effective. The young dogs are observed while wandering the swamp. When they encounter a snake they are yelled at to get them away from it. The snake is then caught and used to beat the dog. The scent of the snake gets all over the dog and the pain of the snake hitting the dog, mimics the strike of a snake. Does this do the snake any good? Nope! That's the end of the snake. Its a barbaric act, but effective. I have seen young dogs treated this way and upon their next encounter with the scent of a snake, jump back away from the smell. This protects them from snakes while tracking a deer. If the deer scent crosses a snake scent, the dog will circle the snake scent and pick up the deer scent on the other side. Its rare a dog trained this way will ever be snake bit. Now alligator bitten is another story. There is no effective training to keep a dog for being bitten and probably eaten by an alligator. It happened rarely, a dog never returns, no trace at all. No circling of buzzards days latter to indicate where something dead lay, because the gator would eat the dog right away or cache it underwater. No proof of an alligator, but what else could it be. That was one of the risks of hunting with dogs in the Big Cypress Swamp. There were several camps in our area of the swamp that used dogs to hunt deer and one that used them to hunt hogs. Before the regulations were changed to not allow hunting with dogs, it was normal to hear dogs running and baying deer during hunting season. Hunting dogs are still allowed for bird hunting game birds, such as quail, but not for other game hunting. The National Park Service and the Florida Fish and Wildlife Conservation Commission use dogs to track and tree panthers, but that's the only use of dogs still going on in the Big Cypress Swamp. Beginning soon after dogs were no longer allowed, we started seeing more deer in the area of our camp. I believe that the dogs used for hunting in our area, chased all the deer out of the area, within a day or two of the opening of hunting season. That no longer happens and more deer are now seen by hunters through out the hunting season. I miss the sounds of hunting dogs, but delight in the improved opportunities to see deer. 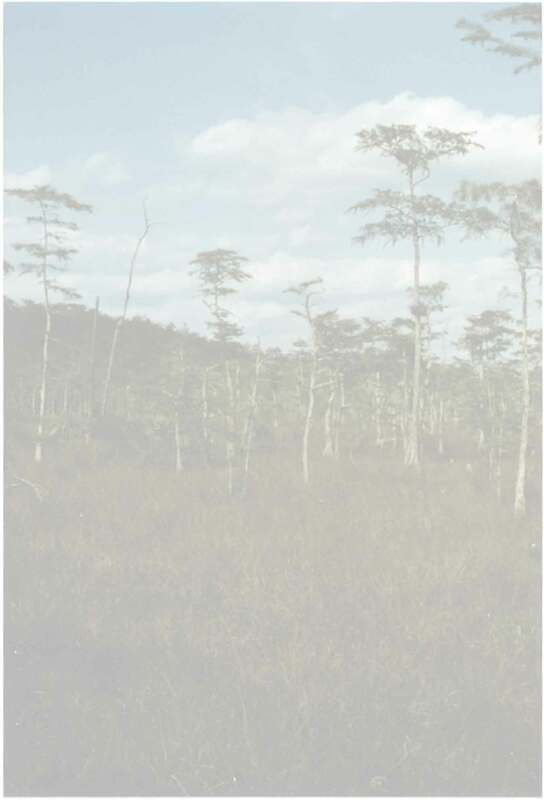 The change of regulations ended a long tradition in the Big Cypress Swamp, but its just one of many traditions that have been lost in the Big Cypress Swamp after it became a National Preserve. There is a sound I miss in the Big Cypress Swamp, baying swamp music in the wind, hound tracking deer, a tradition lost and not to return. Swamp music in the wind!